The method uses 3D printed titanium implants that are anatomically specific to the patient. Store worker Debbie Hawkins from Swansea was the first patient to have the "amazing" procedure. Surgeons rebuilt a section of her jawbone after she developed a tumour. The technique combines traditional bone grafts with 3D printed titanium implants that can be created to fit an individual patient's anatomy. Ms Hawkins said: "When they told me what the procedure involved I was scared at first. I really didn't know what to expect. But what they have done, and the aftercare I have received, has been absolutely amazing". Surgeons removed and rebuilt a section of Debbie Hawkins' lower jawbone after she developed a tumour - which had grown to the point where there was a risk it would have broken her jaw. "Now and again I do have a few problems with my speech because I'm having to make certain jaw movements," she added. "But I'm feeling much better. I get my odd days but otherwise I'm getting stronger all the time." Image caption Debbie Hawkins, pictured with consultant surgeon Madhav Kittur, was the first patient to have this surgery. Morriston's 3D technology uses the patient's CT images to design an anatomically-accurate titanium implant which fixes the fibula bone in place and maintains the aesthetic shape of the jawline. 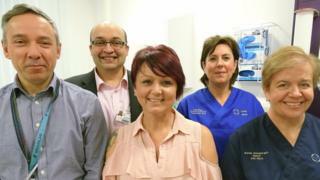 Peter Llewelyn Evans, Maxillofacial Laboratory Services manager at Morriston Hospital, said: "The titanium implant fits the patient's jaw perfectly without the surgeon having to do any adjustment." Ms Hawkins' consultant surgeon, Madhav Kittur, said five procedures had already been carried out at Morriston, with a sixth in the planning stage. He added: "It has taken away the uncertainty. We know exactly what is going to happen before we go into theatre as everything is computer planned. "This can save a lot of time - up to two hours. On average this operation takes eight to 10 hours, so when we take two hours out of that it is quite a sizable reduction. "This is a big advance. It's better aesthetically, the patient is under anaesthetic for less time, and recovery is better. "Although we haven't yet measured it, I would even say that the length of stay in hospital is also reduced."